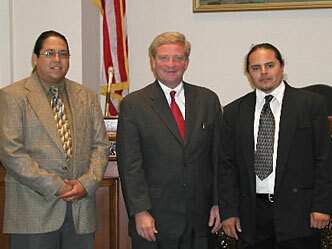 Ohio Rep. Bob Ney, center, poses with Tigua Tribe Lt. Governor Carlos Hisa, right, and Raul Gutierrez, then a member of the tribes governing council in a hearing room after a meeting with Ney on Capitol Hill in August 2002. Ohio Republican Rep. Bob Ney didn't recall meeting with members of the Tigua tribe of Texas when Senate investigators questioned him during a probe of rogue lobbyist Jack Abramoff. But leaders of the El Paso tribe who lost $4.2 million to Abramoff remember small details of their get-together in Ney's Capitol Hill office and even took pictures with Ney. The meeting with Ney occurred on August 14, 2002, a few days after the congressman and two of his aides returned from a golf trip in Scotland with Abramoff, former Christian Coalition leader Ralph Reed, a pair of lobbyists at Abramoff's firm, and former White House official David Safavian, who was convicted last week of lying to investigators about the trip. "He was red like a lobster from that Scotland trip and had a terrible sunburn," recalled Tigua Lt. Governor Carlos Hisa, who said his tribe was asked to pay $50,000 for the trip. When it balked, two other tribal clients of Abramoff's paid $100,000 to cover their expenses. In an interview on Monday, Hisa said he found it "strange" that Ney told Senate investigators that didn't remember meeting with the tribe and wasn't familiar with the Tigua. Ney accepted $32,000 in political donations from the tribe and had agreed to put legislative language in bill to reopen a closed casino they owned. The measure never became law because it lacked Senate support. E-mails disclosed last week by the Senate committee show that Abramoff and Ney knew in July 2002 that the Tigua's provision was dead in the Senate, but didn't tell the Tigua until that October. "He seemed like a swell guy at the time, and never mentioned any problems with the legislative language," said Hisa. "He is a smart politician, I'll give him that much." Election records show that Ney refunded $2,000 to the tribe in December 2004. Ney spokesman Brian Walsh said the congressman donated the rest of its contributions to the Ohio Republican Party and charities including a boy scout troop and women's shelter. Walsh said that the tribe called itself the "Ysleta Del Sur Pueblo" when it contributed to Ney, and that could be why Ney told investigators he was unfamiliar with the "Tigua." He said Ney "made a good faith effort to be responsive" to the committee's inquires. Hisa said his 1,300-member tribe got a confidential monetary settlement from Abramoff's old law firm, Greenberg Traurig, but is still out a significant amount of money. He said it hopes to recover more when Abramoff and other lobbyists who pleaded guilty in the case are ordered to pay restitution to victims. "I don't want them to walk away with a slap on the hand," said Hisa. His tribe has turned its casino, which once employed 1,000 people and made $60 million yearly, into a concert venue that employs 70 people and barely makes money. The revenue losses mean it has had to cut basic housing, health care and education programs for its members. Hisa said he'd like to sit down with Ney someday to discuss what happened with Abramoff, but doesn't think he'll ever get the chance. "Right now, with the scandal going on, I don't think that anyone in Washington wants to talk to me," Hisa said. "Once you mention Abramoff, people start walking away."